Yesterday I shared a look at my Easter Party prep on our patio, so today I wanted to share a closer look at the gorgeous dessert bar I created and all the details for recreating it at home. Get ready for some yummy treats! There’s no shortage of Chocolates Bunnies available whether you are at the grocery or the drug store, so swoop up some of your prettiest finds and display them on a cake stand alongside your desserts. These make the display even more festive and make for fun party favors! I am in love the accessories that bring this display to life. To add color to the console, I draped my Grandin Road faux Floral Garland along the back! It’s amazing how it makes the desserts pop!! I served the desserts alongside the sweetest Easter Plates. Then throughout my patio I sprinkled gold bunnies and Grandin Road Designer Eggs. I especially love the eggs displayed on the cake pedestals as a centerpiece on our coffee table! (See more decorations to shop below!). 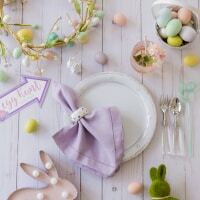 Find more Easter party inspiration in my Easter section! love all these treat ideas! !